It’s been a while now since my operation (which Wikipedia assures me is actually called an appendicectomy). For a few days, it seemed like the amount of discharge I was squeezing out of the main surgical wound wasn’t decreasing. One day, I happened to squeeze a little harder than usual and forced out a maggot of solid, pale green-yellow pus; and then I squeezed out another, larger lump, almost the size of a bean (although not as wide) – and later on, a third. After the last one, the liquid pus, mixed with a little blood, flowed more freely. Even I was somewhat disgusted. Habiba’s exclamations at the last specimen were quite entertaining. Since then, the amount of discharge has slowly tailed off, to the point where it now only generally comes out when I squeeze it – yesterday’s daytime gauze and pad were untainted when I removed them. I could probably leave the incision alone and it might heal, better, but I’d be worried about a build up of pus inside me. Then again, the body must have ways of dealing with that kind of thing. As I write this, I’m in a 24-hour McDonalds near City Hall in Seoul. It’s the middle of the night. I have a 5:30 train to catch down to Busan on the south coast (a bullet train, no less), from where I’ll take a ferry to Tsushima, a Japanese island in the Korea Strait. I have to: my tourist visa is due to expire on Sunday. Habiba and I had been planning to go to Japan last week, but events conspired against us. Now, I’ll return on Sunday with another tourist visa good for three months. Hopefully, I won’t need another. I’ve started making inquiries into getting a job for September. This will actually require another visa run, as the E-2 teaching visa can only be obtained in a foreign country. I’ll probably be heading down to Japan again. I went back to the hospital where I had my appendectomy today, where the doctor re-examined my stitches. The main one, near my belly button, has a ‘mild infection’. She gave it a few squeezes and said I should come back every day for about a week to have it checked. The one that had the tube coming through it for a couple of days after the op looks fine and is no longer bandaged. When I first went in, I told her that the wound had been hurting and I could feel air bubbles moving around inside me. 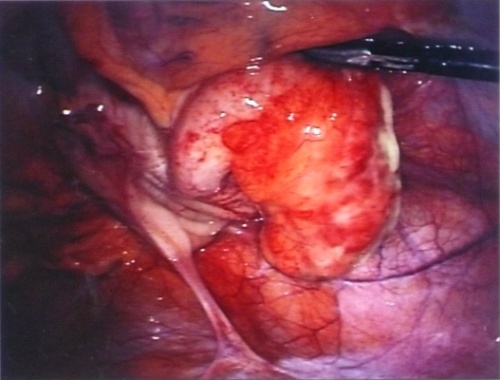 She wasn’t concerned and replied with the rather gnomic pronouncement, ‘Time heals all.’ She also gave me a photo of my appendix taken during the operation. The offending body part is apparently the big orange lump on the right. So, I’ll be returning there every day for a while, but at least it looks like I won’t have to pay any further. Which is good. Earlier in the day I went to see a different doctor at a different hospital to get more of my colitis medicine – a month’s prescription that cost me nearly ₩200,000 (about £115 or $190). On Wednesday night, right after getting into bed, I started feeling an annoying cramp in my lower abdomen. It got worse as the night progressed, and I started to wonder whether I’d got food poisoning or something. I took a couple of paracetamol (which, I recently discovered, is nothing but a different name for acetaminophen, the active ingredient in Tylenol) and a couple of ibuprofen. Then I had a crap and tried to vomit – succeeding after a while. The pain didn’t get any better – it now seemed focused on the right side of my belly, above the hip. Eventually, around three o’clock, I woke Habiba and told her I was worried about it. I sobbed a bit, although tearlessly. I said I thought I should go to a hospital. So we got dressed. I put on a T-shirt and jeans over my boxer shorts, not bothering with socks, grabbed my phone, wallet and passport. With Habiba holding my hand, I made my way gingerly down the alley to the main street and got a taxi (there are always taxis waiting for fares on either side of the zebra crossing) to Eulji Medical Center – a fairly large hospital that I knew to be not far away. When we got there, it appeared closed, so the taxi driver took us to another one. Soonchunhyang University Hospital’s emergency room was fairly large, cool and not very busy. There were a few westerners there, not necessarily English-speakers – there was a couple wiht a blond, curly haired toddler. I checked in and was put on a drip. Then I had physical examinations, X-rays, an ultrasound scan, more X-rays and a CT scan. During the ultrasound, the staff told me I had gallstones, but the pain in my abdomen was lower down. Eventaully they told me the likely diagnosis was appendicitis and a CT scan would determine this for sure, but it would be expensive, maybe ₩700,000 (about £408 or $665). I got the scan and it turned out to be appendicitis. They told me that an operation would be very expensive, so they recommended that I go to another, cheaper hospital. Habiba went home a little before this, to get some sleep before going to work. I pad by credit card – it turned out to only be ₩611,000 (being, officially, a tourist, I have no insurance). Then hung around for a bit to be ferried by ambulance to Songpa Chung Hospital, near Olympic Park at around 8am on Thursday. This was a smaller hospital. The ground floor consisted of a lift and staircase and a small car park. The next floor up had a waiting room and a few consultation rooms. The building had nine floors, though, including ground and basement floors. It was a nice enough place, very clean and modern and beige. I was seen by a doctor, then given pyjamas to change into. I had my operation at about 10 o’clock. In the operating room, the anaesthetist put a mask on me and told me to take deep breaths. I did so, not feeling anything for a moment. then my face started to tingle. The next thing I was aware of was being lifted from the operating table to a bed and being told to stay awake by breathing deeply. I did as I was told, but it was difficult. My eyes wouldn’t focus and I kept nodding off, but the staff would keep me awake. This went on for about an hour and half, if I remember rightly. I shared a room with two Korean men on the 6th floor and spent the rest of the day drifting in and out of sleep. I had a band fastened around my middle, and underneath, two large and one small bandages stuck on me – one over my belly button and the others down amid my pubic hair, which had been partly shaved. The lower, larger plaster had a rubber tube coming out of it, which was attached to a little rubber flask that collected what appeared to be pus and blood. I kept the flask in my pyjama pocket. Habiba came to visit in the evening, bringing me some of my things. The nurses wanted me to pee – this would be a sign that everything was OK. However, being very dehydrated, I didn’t have any liquid to produce for a long time. I tried to drink water (once they let me), but it made me feel a bit sick. My throat was very sore from being intubated during the operation. I had a headache that lasted about until I was discharged. The following day – Friday – I started eating food – Korean soup and plain rice porridge with a little soy sauce. By Saturday morning, I was fed up with this fare. Habiba had people to meet in the evening so she didn’t come to see me on Friday. I cheered myself up by watching some Only Fools and Horses. I got a bit of reading done, too, but mostly I felt pretty miserable all day with my ongoing headache and the noise of the wards – each room had a plasma screen TV and visitors came and went freely. Nurses came to check my blood pressure and temperature regularly. 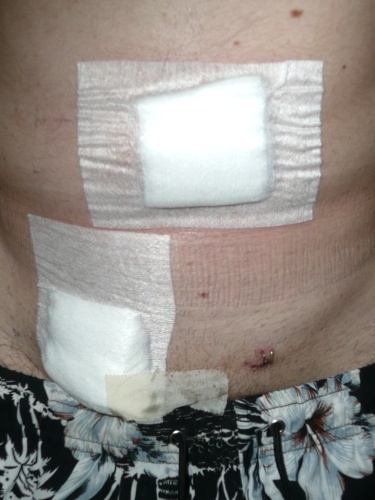 On Saturday morning, I had my drip and flask removed and the doctor had a look at my scars. She squeezed some pus out of the top one and fiddled with the stitches (this was painful, but not as painful as having the bandage peeled off) and told me I should come back on Monday to be checked for infection. I was also to go back on Thursday to have the stitches removed. A bit later, the vice director (he was a man who spoke good English; most of the nurses and doctors were female, and the nurses usually didn’t speak much English) came to take me to an office to pay. I used my credit card again, and fortunately it went through. The cost was just under ₩2.8 million (£1,630 or $2,660), bringing the total to just under my credit limit of £2,000. I have enough savings still to cover it. Habiba and our Korean friend June came to pick me up and we had lunch and coffee before going home. Having had a vending machine coffee earlier and some orange juice (which I bought from a nearby convenience store in my pyjamas) and a banana (given to me by one of my wardmates; I was told my potassium levels were low), I was starting to feel human again. The whole incident, besides being painful and expensive, has interfered with our lives in other ways. I was going to go to another hospital on Friday to get another prescription of my colitis pills and suppositories; that’ll have to wait until Monday, now, and I don’t really have enough of the tablets to see me through. We were also planning to go to Japan yesterday for the week of Habiba’s school holiday; we’ve cancelled that – at least we’ll get a bit of money back from the flight and hotel. She’s going to go down to Busan, a city on the south coast, with a friend for a couple of days instead. I’m going to stay here and convalesce. Right now, the pain that blossomed anew with the doctor’s examination of my stitches yesterday is starting to subside. I just had a careful wash/shower, avoiding wetting my wounds. The smallest of the scars is uncovered and looks fine; it has two staples holding it firm. The other two are still covered and I don’t feel 100% confident in saying they’re healing without being able to see them. I’ve also got this bubbly, sloshy sensation in my abdomen. If I’ve been lying in one position for a while and then turn, something moves about inside. Somewhat troubling. I’ll tell the doctor about it when I go back tomorrow.